Purslane has been considered a weed that many vegetable gardeners have struggled for years to remove from their gardens. Recently, they've gained a lot of fame for their high vitamin C and Omega 3 content. Purslane is a hardy plant that can easily be grown indoors throughout the year. Once your plant begins growing, you can break off leaves to add to with other vegetables for meals. Collect your seeds by buying them online or gather the black seeds from the seed pods of wild purslane. The plant grows in abundance in most regions. Fill your plant pot with rich potting soil. You can add soil from your home compost bin as fertilizer. Sprinkle a small handful of the seeds evenly over the top of the soil. Rake your fingers gently through the soil to cover the seeds. Water the seeds so that the soil is moist, but not soggy. Keep the soil moist with water each day while the seed is germinating. Purslane will begin growing within two weeks. Keep your plant in a sunny location. Give the plant just enough water to keep the soil moist. Rinse the purslane leaves in a colander under running water to wash off sand and dirt clinging to the plant. Fill a saucepan halfway with water and bring to a boil over medium heat. Add 4 cups purslane leaves to the boiling water and cook in the boiling water for two minutes. Drain through a colander, and rinse with cold water to stop the cooking, and serve as you would lightly cooked spinach. Rinse purslane tips in a colander under running water to rid the tips of sand and dirt. Arrange three shallow bowls in a row on a counter. Fill the one bowl with 1 cup flour, the second with two beaten eggs and the third with 1 cup of bread crumbs. Heat 1/4 cup vegetable oil in a skillet over medium heat. Toss 2 cups purslane tips in 1 cup of flour, shaking off the excess. Dip the floured purslane tips into the beaten eggs and roll them in 1 cup bread crumbs until coated. Place the breaded purslane tips into the oil in the hot skillet, and cook over medium high until lightly browned on all sides, about five minutes. Remove the cooked purslane tips from the skillet to drain on paper towels, and serve. Purslane flowers are native to Persia. These plants have been cultivated for more than 2,000 years. Purslane was brought over from southern Europe to the United States. Purslane flowers are most common in the eastern states. This plant becomes less common the farther west you go in the United States. The least common place to find purslane flowers is in the Pacific Northwest. Purslane flowers are succulent plants with trailing, purplish-red or green stems reaching 4 to 20 inches. The stems are covered with thick leaves 1/4 to 1 1/4 inches long with a smooth edge. Clumps of purslane reach 2 feet across. Purslane flowers produce tiny oval black seeds with a white scar at one end. 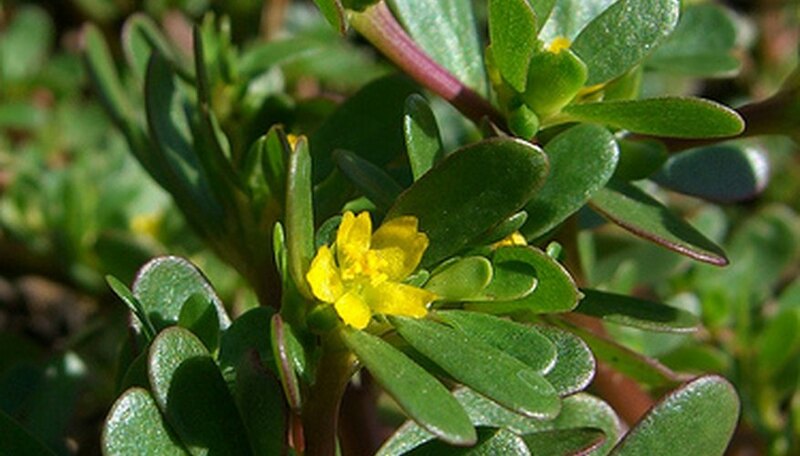 Purslane is occasionally eaten as a vegetable. It has a sweet, acidlike flavor that tastes like watercress or spinach. This plant contains antioxidants, vitamins, protein and amino acids. Purslane is used in salads and ethnic cooking. The seeds are eaten raw or ground and baked into bread. Purslane flowers are considered a weed in most gardens. Purslane creates dense mats of foliage that push out other plants. These plants reproduce from stem fragments or seeds. One purslane plant produces 240,000 seeds that stay viable for 5 to 40 years. The best control is to destroy the seedlings before they can produce seeds. Pick purslane when the leaves are green, either right before flowering or when flowers are in the height of bloom. Leaves that are picked after the flowers go to seed will be bitter. Rinse the purslane in cool water to remove dirt and debris. Cut the leaves and stems into 1-inch pieces with a sharp knife or kitchen shears. Fill a pint- or quart-size canning jar with the prepared purslane. Leave 1 inch of space between the top of the purslane and the rim of the jar. Peel and slice three garlic cloves and add them to the jar along with 10 whole peppercorns. Fill the jar to the rim with apple cider vinegar. Place a new canning lid on top the jar then screw the canning lid ring on tightly. Place in the refrigerator and allow the purslane to pickle in the cider mixture for at least two weeks before using. Sow purslane seeds about 1/4 inch deep and 2 inches apart in loose, rich garden soil. Plant seeds as soon as the last frost has passed. Pick an area that gets full sun. Water the seeds to a depth of 1 inch after planting. Keep the soil moist while the seeds are germinating and developing. Seeds will sprout in seven to 10 days. Thin the seedlings to 6 inches apart when they are 1 to 2 inches high. You can discard the thinned seedlings or transplant them into another area of your garden. Cut the flowers off before they go to seed. Purslane grows like a weed and can easily take over a garden if left to itself. Harvest the leaves and shoots after 60 days when they are still young and tender. Review the plant's shape. Purslane takes on a prostrate form, creeping along the ground close to the soil surface. The plant rarely gets higher than 3 to 4 inches. Inspect the plant's stems. Purslane has red-hued, smooth stems that radiate out from a central point. The stems typically grow to approximately 12 inches in length, according to the University of California. Check the plant's leaves. Purslane stems are covered in green leaves that form on opposite sides of the stem and reach a maximum length of approximately 1 1/4 inches, according to Virginia Tech. Feel the plant's leaves. Purslane leaves have a thick, fleshy texture much like the leaves of a succulent plant. Look for flowers or seed pods. Purslane plants produce yellow flowers that measure 3/8 inches across and have five petals, according to the University of Florida. If a seed pod is present, it should be filled with black or brown seeds. Clean mowers and gardening tools prior to using in an uninfested area to prevent purslane from getting a foothold in the landscape. Water the infested area; when the soil drains, hand-pull any purslane that you find. Because digging in or disturbing the soil may unearth other seeds, this procedure may need to be repeated frequently. Dig up, with a long handled hoe, larger patches of purslane. Remove the plants from the area and dispose of them. Apply 3 to 4 inches of mulch to gardening beds. The thicker the layer of mulch, the better, because cutting off light will not allow the seeds to germinate. Apply pre-emergent herbicide, according to package directions, to areas where there are purslane seeds. Water the area after application to activate the herbicide. Apply post-emergent herbicide, according to package directions, to control actively growing purslane. Scientists at the University of California, Davis, recommend treating the weeds at the seedling stage. Select a location to plant the portulaca. If the garden soil is not heavily sand, choose a plant container to grow the flower. Make sure the container has adequate drainage holes; if the roots of the portulaca stay soggy, it will rot the plant. Mix equal amounts of the rich potting soil with clean sand. Add this mixture to the clean plant container, filling it more than half full. Remove the portulaca from its nursery container and place in the center of the new container with the potting mixture. Add more potting mixture around the portulaca’s roots, until the roots are completely covered. Tamp down gently and water thoroughly to remove air pockets. Place the plant container in full sunlight. Water the portulaca only when it begins to wilt and then water it well, making sure the water runs out of the container’s drainage holes. Choose a hot, dry location in full sun. Rose moss is often planted in garden beds with bulbs or in rock gardens. Scatter and then rake rose moss seeds once the soil warms in the spring. Lightly water. The seeds should germinate within 2 weeks. As time goes by, you can pull unwanted plants if too many are thriving. Dig a hole that is twice as wide as their current containers, but just as deep. Take the plants out of the containers and place them in the holes. Back-fill the soil and tightly pat it down to remove any voids in the soil. Water just enough to make the soil moist. Space individual plants about 12 inches apart to make a nice ground cover in just a couple of months. Portulaca seeds should be started indoors about six weeks before your final frost date. The seeds will must be imbibed before planting. This means putting the seeds in soil in a plastic bag and leaving them in refrigerator for two weeks to become hydrated. After they're removed and potted, the seeds should germinate within 21 days. Sow seeds directly into the soil after your final frost date. They should be planted in full sun. Portulaca's soil should be sandy, with a pH of 5.5 to 7. Portulaca has a very high drought tolerance; once it's planted, you may never need to water it. It does not need fertilization. Portulaca may develop root rot if the soil does not drain well. It does not like "wet feet." According to the University of Florida Extension, portulaca is susceptible to white rust, which causes swollen, badly formed branches and leaves with white pustules. If your plants develop white rust, remove and destroy the infected plants at the end of the growing season. Do not compost any parts of the infected plants. Portulaca will self-seed very readily, and in some gardens it can become invasive. If you do not want it to spread, remove the plants before the flowers go to seed. Collect the 1/4 inch oval seed pods growing on the portulaca plants. Pick the seeds before they ripen, as they scatter when the portulaca pods split open. Place the seed pods in a paper bag to dry at room temperature. The seed pods split open when they are ready. Place a strainer over a large bowl to catch the seeds. Rub the seed pods against the mesh of the strainer, forcing the seeds through the mesh and leaving the shell debris in the strainer. Plant the portulaca seeds on the surface of moist, well-draining soil and in light. Fill your containers with potting soil. Rinse the containers with 1 part bleach and 9 parts water to sterilize them. Cut a 2- to 5-inch long stem tip with a sharp, clean knife. Remove the lower leaves from the stem so that there is at least 1 inch of bare stem. Place the stem into the potting soil to a depth of at least 1 inch. Spray the cutting each day with water until the soil is wet. Portulaca roots will form in a couple of weeks. Choose between purchasing seed or established plants. Seeds will offer more variety and are a cheaper option, but established plants are easier to grow in the beginning and give more immediate results. Decide when to buy portulaca. In zones 8 and cooler, plant portulaca established plants in the spring after the danger of frost has passed, or plant them any time of year in warmer climates. Alternatively, in zones 8 and cooler, plant seeds in the spring when temperatures are consistently above 70 degrees Fahrenheit, or in warmer zones, plant seeds in either the spring or fall. Determine how many plants or seeds to buy. Depending on the variety, portulacas need about 6 to 12 inches of space to grow to their mature size. If planting seeds, purchase enough to lightly scatter the seeds outdoors in your space. You will thin them out later. Buy portulacas at a garden center or online. Call your local garden center prior to visiting just to be sure they have what you want. Purchase plants that look healthy and are not wilting or browning.